Bob Martin Home Flea Fogger Plus is the simple and convenient way to combat flea infestation in your home in one easy treatment. Its unique triple action formula kills fleas and ticks on contact and goes on killing fleas, ticks and larvae for up to 3 months, whilst also preventing any flea eggs from developing for up to 7 months. 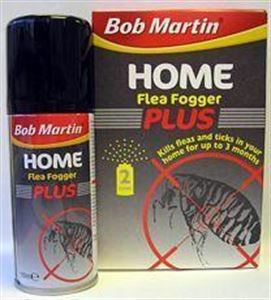 Clinically proven, the Bob Martin Home Flea Fogger Plus will treat carpets, rugs, soft furnishings and pet bedding and leaves no sticky odour or residue.